The Little Book Of Big Appellate Tips | Appealingly Brief! As an appellate advocate for the better part of twenty-five years, I’ve collected many pearls of wisdom on brief writing and oral argument from great appellate judges and lawyers. To name just a few: former Connecticut Supreme Court Chief Justice Ellen Peters, for whom I clerked in 1990-91; retired Justice David M. Borden; and my mentor, the late Hon. Mark R. Kravitz, who was Wiggin & Dana LLP’s appellate guru before he became a federal judge. After much cogitation, I’ve decided that it is selfish not to share the appellate wisdom of such great minds with other lawyers. So I wrote a book! 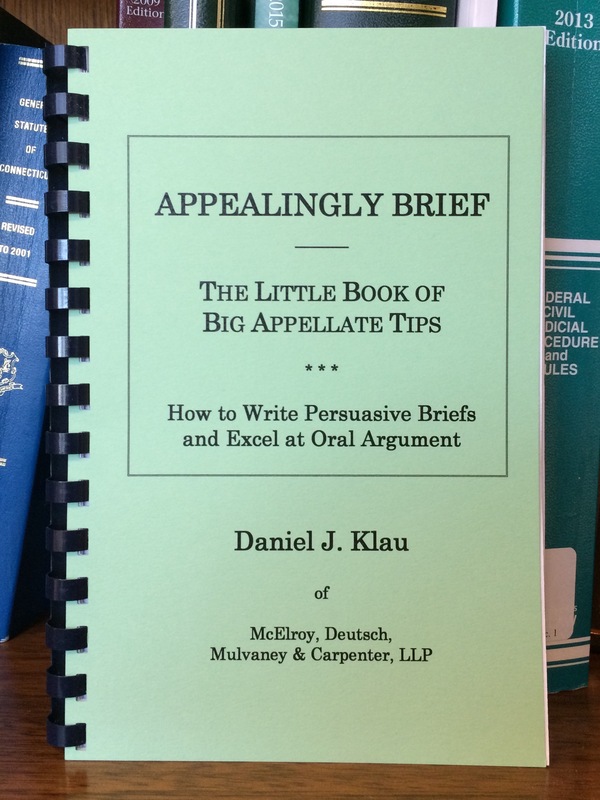 It’s titled, naturally, Appealingly Brief: The Little Book of Big Appellate Tips (Or How to Write Persuasive Briefs and Excel at Oral Argument). It contains 37 specific tips, many with multiple sub-tips, pointers and suggestions, for improving appellate brief writing and oral argument skills. The e-version (pdf format) is available now and the print edition will be released in early November 2015.